JAKARTA - Post-launched in the office of the Coordinating Ministry for Economic Affairs, Jakarta, Friday (31/8), the expansion of the use of the 20 percent Biodiesel (B-20) mixture is now required to be carried out by the public service obligation Oil Fuel (BBM-PSO) business entity, non PSO transportation sector, industry, mining, and electricity. In order to safeguard this policy, the Ministry of Energy and Mineral Resources (ESDM) will supervise this policy through a silent audit mechanism. "To oversee this mandatory implementation, the Ministry of Energy and Mineral Resources will conduct an audit, which we call a silent audit. As the name implies, so when will the team come to audit, there will be no prior notification. The team is there or not, no one knows, but there will be which moves to gas stations ", explained the Director General of Renewable Energy and Energy Conservation (EBTKE), Rida Mulyana. Rida added, the audit was carried out not only to the oil and fuel (BBM ) provider, but also the supplier of B-20 (Bio Fuel BU). "This policy is firmer and fairer," he continued. Meanwhile, regarding the implementation of the B-20 that has been running since 2016, Rida stressed that there were no complaints from the sector that had implemented for 2.5 years. "It has been running for 2.5 years and there have never been complaints. Logically, if there is a complaint, it should be from the new sector that carries out this mandatory. There will be no adverse policies, all in the interests of the state," he said. 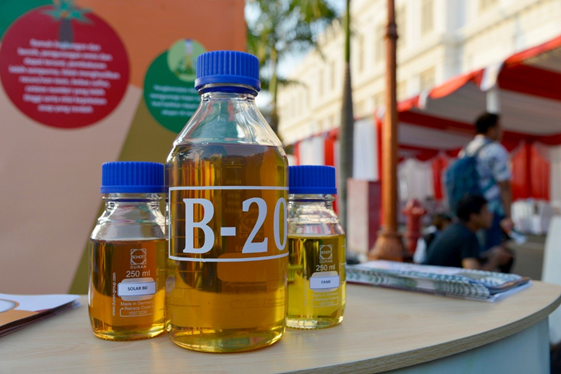 In addition to strict supervision, the Government confirmed that since September 1, 2018, there will be no more B-0 products on the market, and the whole will be replaced by B-20. If the BU oil and fuel (BBM) does not mix, and the Biofuels BU can not supply FAME (Fatty Acid Methyl Ester) to BU BBM it will be subject to a heavy penalty, which is Rp. 6,000 per liter. Some exceptions can be applied especially to Power Plants that use aeroderivative turbines, the main weapon system tools (defense equipment), and Freeport mining companies located at heights. Against these exceptions, B-0 is equivalent to Pertadex. Rida hopes that the community can assist the Government in the success of this policy, so if the community may find irregularities in the implementation of the B-20 mandatory, the community can contact the 14036 call center that has been formed by the Oil Palm Plantation Fund Management Agency (BPDPKS).